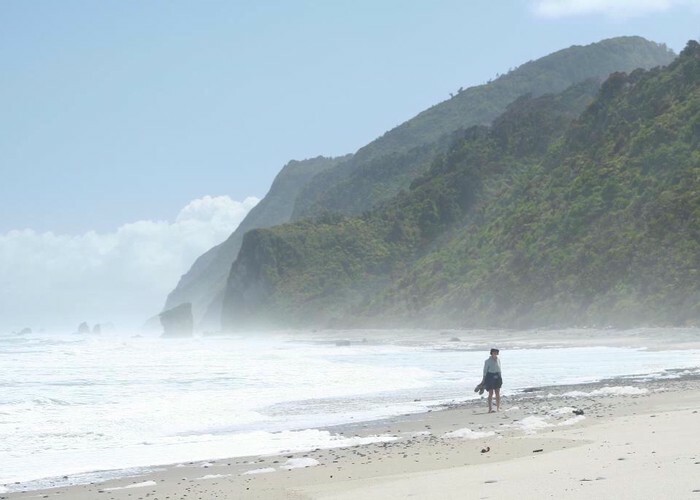 A short walk to a secluded West Coast beach. Beach near Gentle Annie Point • By Matthew. De Malmanches Road end, off SH67 on the north bank of the Mokihinui River. From Mokihinui, drive across the river and take the road on the left, heading toward the river mouth. Follow this road past a camping area (Gentle Annie) and a few lodges to a wide parking area just before the 4WD road starts to climb over the point. Continue from here on foot. Follow the road through regenerating coastal scrub on to the point. Locals have cut a maze through the vegetation leading to a view point. The view is not very good but the maze is diverting. Watch for Powelliphanta (giant land snail) shells around the road. The road soon drops down to the long granite rock and sand beach, and you can walk as far as you like. The beach is very isolated, and you will probably have it all to yourself. However, it is not safe for swimming. Allow 1 to 2 hours, depending on how far you want to walk. Added 5 January 2009 by MatthewMatthew. 3 revisions, most recently 5 January 2009 by MatthewMatthew. 124 views in the past year (10 per month).